A Greek dessert of custard (sometimes flavored with lemon or orange) in phyllo. It may be made in a pan, with phyllo layered on top and underneath. It is served or coated with a clear sweet syrup. Its name is derived from the words gala (γάλα; milk in Greek) and bourek (Turkish word burek: pie or pastry). 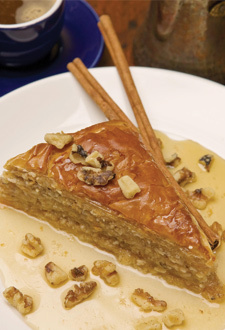 A popular Greek pastry made with a special form of shredded phyllo dough which is also called kataifi. This dessert is made with nuts and honey which makes it flavourful, crunchy, and very sweet. Probably one of the most recognized Greek pastries, baklava is a rich, sweet pastry made of layers of phyllo pastry filled with chopped nuts and sweetened with honey. Diples is a deep fried Greek pastry which is a cross between a doughnut and a funnel cake. In addition there will be a variety of Greek cakes and nut rolls available for you to enjoy. And be sure to head over to our Kafeneio to enjoy a Greek coffee or Frappe with your dessert!